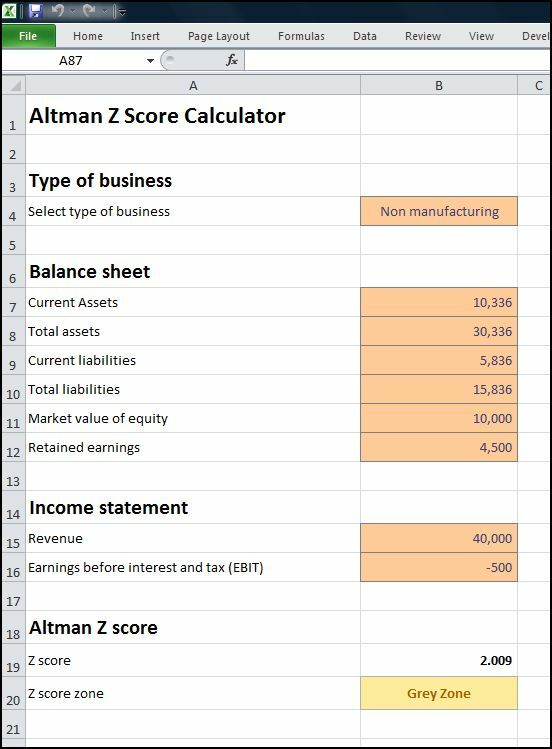 The Altman Z Score calculator model takes five key accounting ratios for a business, weights them according to an industry type, and combines them into a single score (the Z score) to give an indication of the financial health of a business. Generally, the lower the Z score the greater the chance of failure. In order to make more use of the Z score, Altman established cut off points or boundaries to enable a business to make predictions. These boundaries classify the business into a safe zone, grey zone, or distress zone. Having calculated the ratios, each one is weighted using preset values according to its industry type and then added together to produce the Altman Z Score. The weighting of each ratio is as follows. The boundaries established by Altman are as follows. Select the type of business. Select whether the business is a public (quoted) manufacturing business, a private manufacturing business, or a non manufacturing business. Enter the balance sheet items. Using the balance sheet of the business, enter values for current assets, total assets, current liabilities, total liabilities, market value of equity, and retained earnings. For a private business where the shares are not quoted, use the book value of the equity instead of market value. Enter the income statement items. Using the income statement, enter values for revenue, and earnings before interest and tax (EBIT) (enter a negative figure if this is a loss). Altman Z score calculation. The Altman Z score calculator calculates the Z score and based on that score, indicates the Z score zone the business is currently in. The Altman Z score spreadsheet is available for download in Excel format by following the link below. Users use this Altman Z score model at their own risk. We make no warranty or representation as to its accuracy and we are covered by the terms of our legal disclaimer, which you are deemed to have read. This is an example of an Edward I Altman z-score tool that you might use. It is purely illustrative. This is not intended to reflect general standards or targets for any particular company or sector. If you do spot a mistake in the Altman Z score template, please let us know and we will try to fix it.